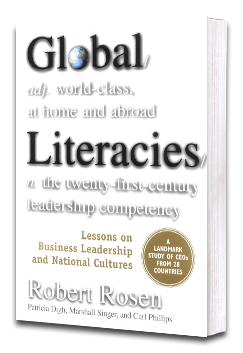 For answers, the authors of Global Literacies went straight to the leaders themselves — the CEOs of thousands of corporations around the globe. Two lessons emerged. First, there are leadership universals that every executive and manager needs to practice in order to be world-class at home and abroad. The second defied conventional wisdom: in the borderless economy, culture doesn’t matter less, it matters more. Around the world, business leaders apply their own experiences — personal, professional, and cultural — to an ever-expanding world of Dutch colleagues, Brazilian suppliers, Taiwanese manufacturers, and Chinese competitors. These leaders are trying to become globally literate…and Global Literacies is for, and about, them. No one knows this better than CEOs of successful global companies such as Japan’s Canon, Sweden’s Ericsson, Taiwan’s Acer Computers, the U.K.’s British Telecommunications, and U.S.-based Coca-Cola. In Global Literacies, a team of researchers led by Robert Rosen, Ph.D., of Healthy Companies International, and Watson Wyatt Worldwide have produced the first model of international business success based on a wide-ranging landmark study of global leaders and their world-class companies. Global Literacies documents the exclusive results of a worldwide survey of over one thousand senior executives and in-depth interviews with CEOs of seventy-eight companies — companies representing 3.5 million employees in more than 200 countries, and with more than $725 billion in annual sales. Learn which are the most globally active, financially successful companies — and countries — in the world, understand how they got there, and apply those learnings to your own organization. Develop ways to see global challenges and opportunities, think with an international mindset, act with fresh global-centric leadership behaviors, and mobilize world-class companies — whether you’re a multinational giant, a domestic manufacturer, or a local community organization. With sophisticated profiles of thirty countries, and survey data from eighteen national cultures — from the Tolerant Traders of the Netherlands to China’s Ancient Modernizers and the Optimistic Entrepreneurs of the United States, Global Literacies is a groundbreaking and fascinating work on the most important issues in the world of business today.